Imagine a free multivendor telecom market without lock-ins or solutions silos. Soon the waiting is over. While NFV is your key to the future, the new market solution is spelled Yotta. Yotta is the answer to telecom operators’ growing desire for faster and cheaper infrastructure solutions. Today’s systems are too expensive and complex, they say. Holding back new customer services. Due to our long experience from being part of and doing business with the vendor side, we have seen this development coming. And we also see the future potential of true NFV solutions offering dynamic networks, flexibility and the absence of vendor lock-ins. But, to make true NFV a reality in a wider context requires a free and vendor-independent market. So that’s what we are doing. 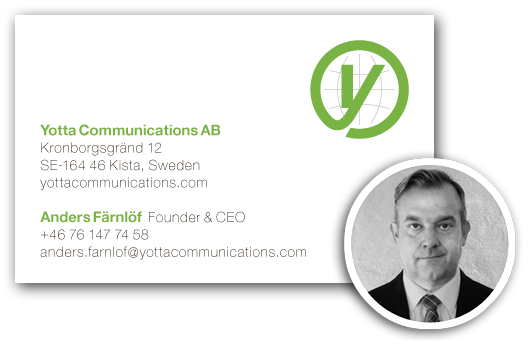 Yotta Communications is a new company founded 2014 on vast experience from the telecom industry. Our business is to make true NFV technology available to operators so they can grow and develop new services. Through Yotta Market and Yotta Labs we offer a vendor-independent VNF feature solution enabling service providers to buy pre-validated multivendor software without any kind of lock-ins or solution silos. Our vision is a vibrating and innovative market where operators can buy best of breed network software to upgrade their live networks – with a click! 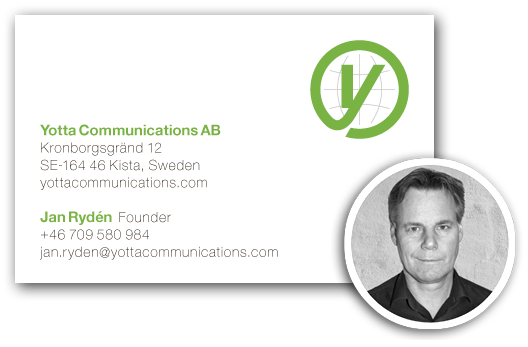 Yotta Communications AB was founded 2014 by industry veterans Anders Färnlöf and Jan Rydén. Both have vendor background and more than 15 years in different management positions. The founders have been active in the huge industry transformation (called NFV) from the very start and came to the conclusion that there is a need for a new type of company. A company focused on delivering true NFV to the operators. Yotta is supported by private investors and we receive very positive responses from operators, vendors and partners for our solution. To build the community, scale up and launch our services, we are teaming up with several of the strongest companies in the virtualization industry. The team is based in Kista outside Stockholm. Contact us and we’ll tell you more about Yotta and the future vendor-independent VNF feature market. We look forward to hear from you.